copy it if you are an artist. for mixing dark shadow colors with out using black pigment. Designed for a natural artist painting on location. All dots are links to each pigments description. Read the linking color name in the browser status bar below. The center links to a list of all the pigments. These color arcs are numbered from 1 to 36. #00. Outer rings, lighter pigment or tint hue of this color. #0. 100% full chroma for opaque pigments, 50% top-tone tint for transparent pigments. 1. 10 shades to dark. 6. 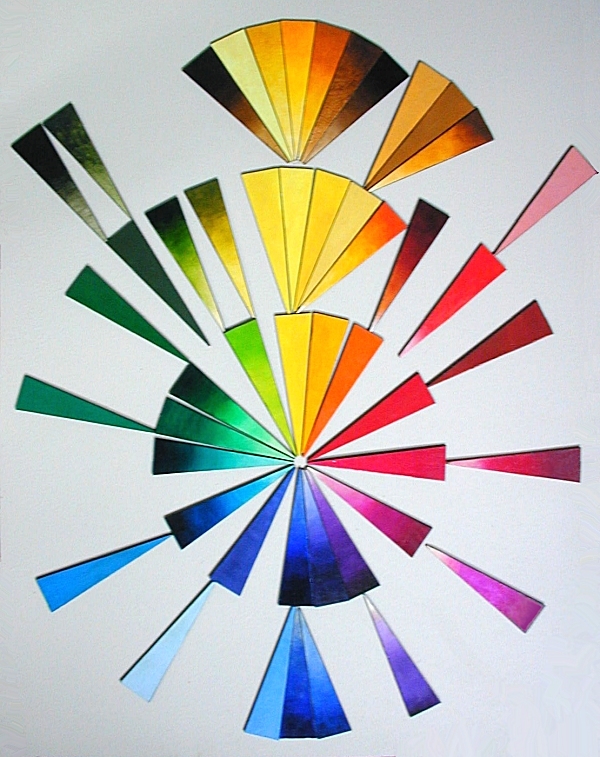 Mass-Color of transparent pigments. 10. 10% intensity of this color. 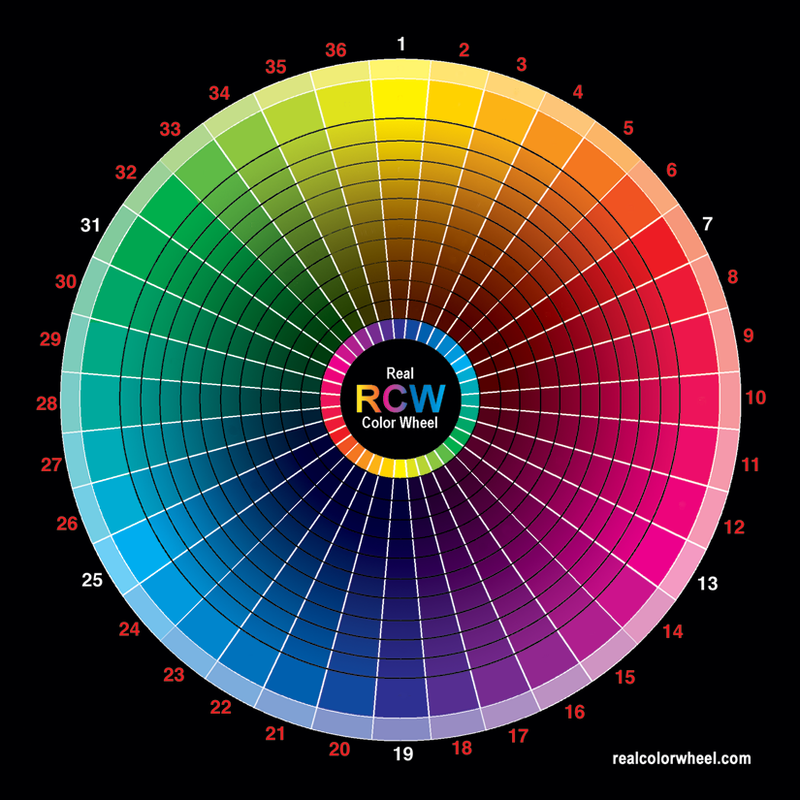 This is a printable photographer's color wheel w/o the dots. The Real Color Wheel matches the way crystals get darker. See elements matching crystals, light, and pigments. This clickable map shows the true opposition pigment colors for mixing neutral darks. It will be the new "basic" color wheel because the color oppositions are accurate. The revolution of a color wheel, replace your old color wheel now. 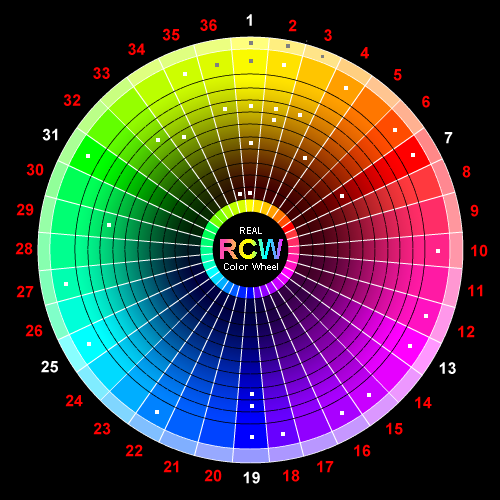 The old Red-Blue-Yellow color wheel is inaccurate for the pigment artist. Here is how to mix the full color wheel with only three colors. See a 3 color example. Equal amounts of yellow and magenta make red, that's 100% of each color. Arc#1, 10 Tint Values of Yellow, 10 Darker Values of Yellow to Dark Brown. RCW02.00= 100% Yellow + 16% Magenta. Pigment Mixing Percentages. Use the same percentages for Magenta to Cyan and Cyan to Yellow. Transparent Yellow to Transparent Magenta, full chroma. Transparent Magenta to Transparent Cyan, full chroma. Transparent Yellow to Transparent Cyan, full chroma. Painting opaquely, yellow darkens to gold ocher then to deep brown. All three of these opaque pigments are needed on the artists palette. One transparent yellow will do it if you are also using transparent magenta and cyan to paint full color paintings. Yellow and orange arcs become dark by adding brown, the same dark brown that matches the red arc. Magenta will get dark by adding it's opposite color or the other two triads, which do combine to make the complement opposition secondary color, green. Magenta arcs change to cyan by adding cyan in 22% increments. Equal amounts of transparent magenta and cyan, arc #19, having 100% of each color, make an ultramarine blue transparent hue. 66% less magenta, three arcs over plus the 100% cyan make a transparent cobalt blue hue. The cyan arc darkens first to cobalt blue, than ultramarine blue before becoming neutral. From that ultramarine hue darker, add the same burnt umber that gets the ultramarine blue arc darker. So #19 thrrough #25 get dark to the same color before becoming dark neutral. Just like #1 through #7 get dark to the same color.